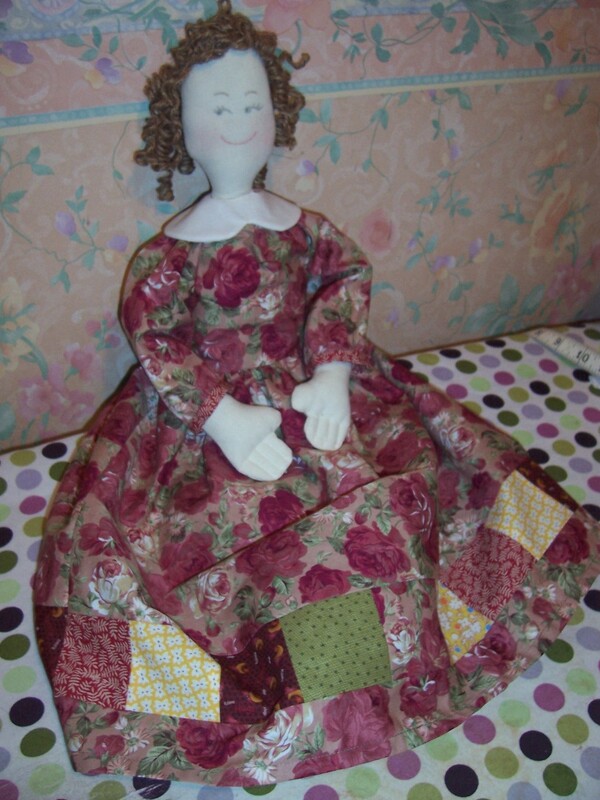 Using a doll pattern by Button Angel as the starting point I have made a rag doll which I christened Polly Patchwork. As a new method for me her arms and legs are only stuffed as far as the elbow/knee joint before attaching to the body. I have added a bosom made from two lightly stuffed circles which gives Polly a more “mature” figure. Polly’s face is drawn with coloured pencils and her rosy cheeks are from a light brush with my blusher. Her hair is made by wrapping pencils with garden twine, spraying liberally with starch and then leaving overnight to dry. At present her hair is a bit thin so I plan to do some more wrapping over the weekend to add fullness to her coiffure. Polly wears bloomers and a button “vest” and will also have a flannel petticoat which is currently under construction. I have made Polly’s legs a little shorter than the pattern which means that they are hidden beneath her dress. To rectify this I plan to make some decorative tucks around the hem of the skirt above the patchwork border. I had a problem making buttonholes at the back bodice so had to resort to narrow velcro fastening. The neckline of the dress is drawn up with a gathering thread and the collar simply sits above and fastens at the back with a tiny safety pin (to be replaced with a button or popper). To complete her outfit, there will be a patchwork jacket made from 90 x 2″ patches, a hat, a pair of shoes/boots and she will also carry a bag. Glad to hear that you liked this post. I have completed the jacket but it did not co-ordinate with the dress so have made another dress using one of my husband’s old shirts.